Belles & Chimes is a international network of women’s pinball leagues. 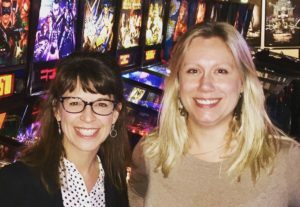 The Houston chapter was founded in 2018 with a goal of providing a fun, safe, and supportive environment for women to socialize and play pinball together. Beginner and novice players of any age are encouraged to join. Playing with others is a fantastic way to improve your pinball skills! For the more experienced players, Belles & Chimes tournaments offer a unique opportunity to earn IFPA points available specifically for women’s-only competitions. Come play with us! We host a variety of events including tournaments, skills workshops, and parties. Check the Space City calendar for event information. Join our Facebook group or follow our Instagram @bellesandchimeshouston. The tournament director will be responsible for managing and organizing the tournament. The tournament director will also be responsible for making any rulings in the event of malfunctions and errors. The tournament director has the final say. If a game requires a ruling that the tournament director is directly involved, the ruling will be deferred to the assistant director. The current tournament director is listed below. Please contact her with any questions about the tournament. Match Play Events will be used to organize tournaments. The software will assign groups and arenas for each round. Players may submit results at the conclusion of a round after verifying with a fellow competitor that the submission information is correct. At the beginning of the tournament, the tournament director will select a set of games to be used that day. Selection will be determined based on condition of the game. Games that have key scoring features that are broken or are producing odd behaviors will not be used in the tournament. If someone is playing on a machine that you are scheduled to play, please politely ask for the next game and wait for them to finish. It is polite to wait until all players arrive before beginning a round. The first player should then add the appropriate number of games and begin. When the round is up on Match Play, arrive within 5 minutes or risk having your ball plunged. Never put drinks on machines. During tournament play, do not distract your opponent by talking to them (unless they talk to you or tell you it’s okay). Do not hover over their shoulders. Do not coach them or give them advice while they play. It is perfectly fine to talk/exchange high-fives between balls. Pay attention to the order of play. If you play someone else’s ball, you must take a 0 for the game. At the beginning of the tournament, the director will announce whether or not extra balls will be played depending upon time and number of players. In the event that extra balls are not being played, when you are awarded an extra ball, you must plunge it. You cannot touch the flipper buttons before plunging. You may try ONCE for a soft skill shot. If the ball does not make it out of the shooter lane on your first attempt, you must plunge the second time at full strength. It is the player’s responsibility to ensure they do not play extra balls by accident. If a player plays an extra ball by accident, they must take a 0 for the game. If a ball becomes stuck during single-ball play, notify the tournament director for help. The ball will be placed on the right or left flipper, determined by the side of the game the ball became stuck on. Pinball machines are mechanical in nature, and thus often produce unintended behaviors. Moreover, many of these machines are very old! If a game malfunctions in any way (e.g., flipper breaks, debris on field, game reset, etc. ), please ask the tournament director for a ruling. The director will attempt to repair the machine without sacrificing the game. If this cannot be done, a new machine will be drawn and all progress in the original game will be scrapped. Our tournaments are sanctioned by the IFPA. Participating in Belles & Chimes events earns points toward World Pinball Player Ranking (WPPR) system specifically designed for Women-only events. Visit the IFPA website to learn more. The value of the tournament will be determined by the number of rated players in the tournament and the ratings of those players.